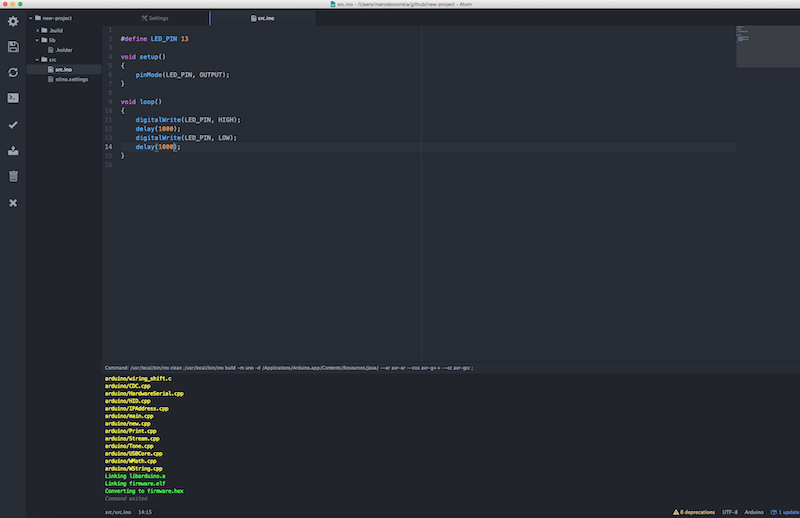 Arduino 1.0.x support in Atom. Originally derived from Kyle Lacy’s run-command. If you’re using an Arduino Uno or Mega 2560, you don’t have any drivers to install. Skip ahead to the next step. If you’re using an older board (Duemilanove, Diecimila, or any board with an FTDI driver chip. You will need to install the drivers for the FTDI chip on the board. You need to download the latest version of the drivers from the FTDI website. One downloaded, double click the package, and follow the instructions in the installer. You’ll need to restart your computer after installing the drivers. Quickly create new projects Build a firmware from multiple source files and libraries Upload the firmware to a device Perform serial communication with a device (aka serial monitor) Ino may replace Arduino IDE UI if you prefer to work with command line and an editor of your choice or if you want to integrate Arduino build process to 3-rd party IDE. Ino is based on make to perform builds. However Makefiles are generated automatically and you’ll never see them if you don’t want to. Simple. No build scripts are necessary. Out-of-source builds. Directories with source files are not cluttered with intermediate object files. Support for *.ino and *.pde sketches as well as raw *.c and *.cpp. Support for Arduino Software versions 1.x as well as 0.x. Automatic dependency tracking. Referred libraries are automatically included in the build process. Changes in *.h files lead to recompilation of sources which include them. Pretty colorful output. Support for all boards that are supported by Arduino IDE. Fast. Discovered tool paths and other stuff is cached across runs. If nothing has changed, nothing is build. Flexible. Support for simple ini-style config files to setup machine-specific info like used Arduino model, Arduino distribution path, etc just once. As for current version, ino works only in Linux and MacOS. However it was created with other OS users in mind, so it will eventually get full cross-platform support. Help from Windows-developers is much appreciated. Take a look at Quick start tutorial. ``` –make MAKE Specifies the make tool to use. If a full path is not given, searches in Arduino directories before PATH. Default: “make”. –cc COMPILER Specifies the compiler used for C files. If a full path is not given, searches in Arduino directories before PATH. Default: “avr-gcc”. –cxx COMPILER Specifies the compiler used for C++ files. If a full path is not given, searches in Arduino directories before PATH. Default: “avr-g++”. –ar AR Specifies the AR tool to use. If a full path is not given, searches in Arduino directories before PATH. Default: “avr-ar”. –objcopy OBJCOPY Specifies the OBJCOPY to use. If a full path is not given, searches in Arduino directories before PATH. Default: “avr-objcopy”. -f FLAGS, –cppflags FLAGS Flags that will be passed to the compiler. Note that multiple (space-separated) flags must be surrounded by quotes, e.g. `–cppflags=”-DC1 -DC2”’ specifies flags to define the constants C1 and C2. Default: “-ffunction-sections -fdata-sections -g -Os -w”. –cflags FLAGS Like –cppflags, but the flags specified are only passed to compilations of C source files. Default: “”. –cxxflags FLAGS Like –cppflags, but the flags specified are only passed to compilations of C++ source files. Default: “-fno-exceptions”.